Maggie O'Keeffe remembers when it all began. "I was listening to the Mets game with my dad, and I have a specific memory of hearing '6-4-3 double play' for the first time and thinking 'What does that mean?'" said O'Keeffe. "My dad told me, and I just started imagining it in my head, being the person who says 'That was a 6-4-3 double play.' Getting to tell people that. That's why I like the radio so much, because growing up I would listen to games, and that way you'd start to form those mental images." Those childhood associations, which soon grew to something perhaps more resembling an obsession, have motivated O'Keeffe to attempt to achieve something that has rarely been done before -- become a female play-by-play announcer in the Major Leagues. O'Keeffe, a 20-year-old Connecticut native now in her senior year at the University of Alabama, has already made headway toward achieving this goal. In addition to working regularly with her campus radio station, O'Keeffe spent the summer of 2013 broadcasting games for the Danbury Westerners of the wood-bat New England Collegiate Baseball League. Now she's in San Diego for the annual Baseball Winter Meetings, attending the PBEO Job Fair with the hope of landing a broadcasting job in Minor League Baseball. If successful, she would join Kirsten Karbach of the Clearwater Threshers, who's currently the only female broadcaster in the Minor Leagues. "I'm just trying to get my foot in the door and see where it takes me," she said. "You've got to take it like the Drake song, 'Started at the bottom, now we're here.' So that's what my plan is, to just move up. I feel like I've started young enough, especially being as directed as I am in what I want to do." Here she pauses, clearly wishing to emphasize just how important this is to her. "This is all I've ever wanted to do." O'Keeffe began working in earnest toward her dream while still in high school, serving as a scorekeeper for the varsity and junior varsity baseball teams. "I would just go out in the boondocks [of the stands], calling the game to myself, and then we'd get on the bus and go home," she recalled. "And then, once I got to [the University of] Alabama, I'd do the same thing. I'd go out to the boondocks of the bleachers and call the game. It's all practice. "I'll record it on my iPhone and then listen to what I've done. You've really got to work at it. The biggest thing was trying to get rid of verbal fillers. That takes a lot of practice, because if you get used to saying 'Um ... ah ... like,' then you've got to eliminate that from your vocabulary. You start to analyze, 'OK, what made me say that verbal filler? Where was it that I thought I needed to pause and use that?' And then you start to be able to better protect against that in the future." O'Keeffe received her first on-air experience after enrolling at the University of Alabama, broadcasting a variety of sports for student-run radio station WVUA. The University's baseball broadcasts are licensed to an outside agency, however, so she got involved with the team via an alternate channel. "I work for the team as a Diamond Doll," she said with a wry smile. "It's the South and it's baseball and they love to have a girl standing there being the batgirl. There are girls doing it to be near the baseball players and look at their butts, but I'm there to network with the coach and the assistant coach. I have a good relationship with the guy who does broadcast the games; he lets me sit in the booth with him during the innings when I'm not on the field." In 2014, O'Keeffe successfully applied to be the lead broadcaster for the Danbury Westerners, thus becoming the first female to do play-by-play in the New England Collegiate Baseball League. "That was interesting, because a lot of people had been working in the league for a while and I'd walk up to the press box and they'd look at me like 'Why are you here?'" she said. "It would take two innings or so for people to realize that I know what I'm talking about. They gave me that opportunity and I was able to prove myself through that, and now I have authenticated 'You're on CBS Radio' broadcasting tapes of me doing baseball." Throughout the season, O'Keeffe had to deal with the resistance and confusion of those not accustomed to hearing a woman broadcast baseball games. "It's almost a good thing -- people might be against it, but after seeing my work ethic and the job I do, then maybe it transforms their mind about the whole concept," she said. "There was confusion from the other broadcasters doing this, because not only was I the only girl, [but] I was one of the younger people doing this. ... To add to the complication, we worked in tandem with the other broadcasters. It'd be one singular broadcast -- the home team would do play-by-play for the first and last three innings. That way both people working the broadcast had an intimate knowledge of each team, but you had to work as a team with this person. Figuring out how to talk without stepping on someone's toes, without having a visual cue, is something in and of itself." But perhaps the biggest challenge was dealing with the players themselves. "We had really long bus trips, and you get 35 20-year-old boys on a bus and you'll get a lot of situations," she said. "They would lock me in the bathroom. Not actually lock me in, but one of them would put his palm on the door while I'm pushing with everything I have to get out. They had this one thing where they thought it would be funny to pick me up in the air at random intervals. So they did that. "And there were a lot of comments, sometimes sexually explicit, but you've just got to let it roll off your back and then give it right back. One specific example is that I was waiting on line for the bathroom in the bus, and one of the boys puts his arm around me and says 'Hey Maggie, what are you doing later?' And I just said 'Not you.' I turned around and walked away, and the entire bus just goes 'Ohhhhhh!' And I earned their respect, like 'OK, clearly she's not going to get embarrassed or start crying or go tell anyone. She can handle herself.' The way I handled it was funny. You use humor and you can bridge that gap. It doesn't necessarily make me angry, because I know it comes with the territory. I'm used to it, because from 13 or 14 I was dealing with it." O'Keeffe is hoping that that such on-the-job experience will now translate to a position with a Minor League team. She attended the Minor League Baseball Promotional Seminar Job Fair in Oklahoma City in September, in advance of traveling to San Diego for this week's Winter Meetings. 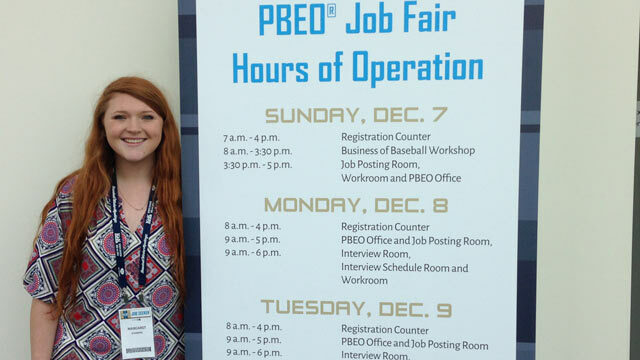 On Wednesday, during the last day of the PBEO Job Fair, she reported that she interviewed with four Class A teams for a broadcasting position. "One of the people who I talked to [in September at the Promotional Seminar] who expressed interest looked at his co-worker and said 'Can you imagine the news coverage we'd get if we had a female broadcaster?' Hey, that's free press. So it can work to your advantage," she said. "But if you get that job, you're still going to face adversity until you establish yourself." Therefore, her potential trailblazer status must take a backseat to an imperative of the broadcasting profession: developing a unique, likeable on-air persona. "You have to have a signature, and mine, personally, is puns. I'm just good at them and can drop them in all the time," said O'Keeffe. "We were going over the lineup card one day, and it was Garrett Black and then Storm Wilson. And I said, 'Well, that makes sense, because it's always black before the storm. ... It got to the point where one of the visiting teams got a sound effect button on their station -- like [sad trombone noise]. "You just have to have that one little idiosyncrasy, because regardless of gender, someone else can do my job if I don't stand out in a certain way."